In a February 13, 2018, post, I explained why any bill that regularizes the status of aliens who have been granted, or would have been eligible for, benefits under the Deferred Action for Childhood Arrivals (DACA) program should not include a confidentiality provision. I specifically focused on the confidentiality provision contained in section 10 of S. 1852, the SUCCEED Act, which had been sponsored by Sen. Thom Tillis (R-N.C.). Tillis had been identified as one of the sponsors of a Republican proposal called "the Secure and Succeed Act of 2018", and I posited that this new proposal would be a combination of S. 1852 and the SECURE Act, S. 2192, which had been introduced by Sen. Chuck Grassley (R-Iowa) (who had been identified as another sponsor of that latest proposal). The language of the Secure and Succeed Act has subsequently been introduced as an amendment to the immigration legislation currently pending on the Senate floor, which uses as a vehicle a non-germane House bill, H.R. 2579. 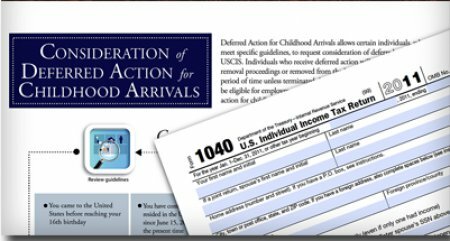 That amendment provides a new conditional temporary resident status, which would eventually lead thereunder to permanent resident status, for DACA-eligible applicants. Section 3008 of that amendment is a confidentiality provision for those applicants. While the language in that section is better than the language in section 10 of the SUCCEED Act, it is still not good. Subsection 3008(b) in the amendment would prohibit the use of information provided by those applicants "as the sole basis to initiate removal proceedings ... against the parent or spouse" of the applicant. This presumably means that the application provided by the applicant could be used to initiate removal proceedings against the actual applicant. This would prevent applicants who have been denied from "melting back into the shadows" if their applications are denied, an issue with the confidentiality provision in the original SUCCEED Act, and a problem caused by the confidentiality provision in the 1986 amnesty. It would, however, create an absurd result in which the Department of Homeland Security (DHS) had information relating to aliens unlawfully present in the United States (the aforementioned parents and spouses) that it could not use. Subsection 3008(c) of the amendment, which requires the disclosure of information provided by applicants for that new benefit, expands the instances in which that information must be disclosed. Subsection 3008(c) of the amendment now requires such disclosures "in connection with" administrative and civil investigations by "Federal, State, Tribal or local government agenc[ies], court[s], and grand jur[ies]." Section 10 of the SUCCEED Act had limited those disclosures to criminal investigations and prosecutions, and "for homeland security or national security purposes", and then, only upon request and when such disclosure was "consistent with an information sharing agreement or mechanism." This is a significant improvement over the prior language. The only problem, however, is the fact that subparagraph 3008(b)(2) in the amendment prohibits "any publication whereby the information provided by any particular individual pursuant to" such application "can be identified." Given this, it is unclear how those "Federal, State, Tribal or local government agenc[ies], court[s], and grand jur[ies]" would know to ask DHS for that information. One particular scenario would involve the adjudicator of that application informing one of the aforementioned entities about such information on the adjudicator's own initiative. Given the vast number of applications that are likely to be filed under the amendment, and the risk of that $10,000 fine for a violation of the confidentiality provision, it is doubtful that any adjudicator would take such initiative. The only issue is, however, that the provision of that information to the LESC would appear to violate the publication restriction in paragraph 3008(b)(2) of the amendment. Taking that paragraph to its logical conclusion (and based on the aforementioned language of that paragraph prohibiting "any publication whereby the information provided by any particular individual pursuant to an application ... can be identified"), any information included in the application (including the applicant's name) could not be provided to the LESC. Simply put, any information that is sent to the LESC would be "published" to any "local, state, and Federal law enforcement agencies" that make inquiries of that center. In light of this, the so-called "required disclosure" in paragraph 3008(c) of the amendment would be a dead letter. Alternatively, such disclosure would likely lead to extensive (and expensive) litigation before this issue was resolved. Needless to say, neither is a positive result. FRAUD IN APPLICATION PROCESS OR CRIMINAL CONDUCT.—Nothing in this section may be construed to prevent the disclosure and use of information provided by an alien under this title to determine whether an alien seeking relief under this title has engaged in fraud in an application for such relief or at any time committed a crime from being used or released for immigration enforcement, law enforcement, or national security purposes. Although the provisions contained a narrow exception to confidentiality permitting investigation of fraud in the applications, the reality is that legalization examiners were too overwhelmed to see or refer much in the way of potential fraud, leaving INS investigative agents pretty much on the sidelines, unable to pierce the veil or gain access to files without such referrals. Confidentiality stood as a firewall between enforcement agents and efforts that would have lent integrity to the legalization programs. The same logic applies here. Assuming that more than a million aliens applied for the benefits in the amendment, adjudicators will be overwhelmed simply by processing those applications, and their ability to identify fraud will be extremely limited, if not nonexistent. As I stated in my earlier post, "confidentiality provisions should not be a part of any DACA amnesty bill: They promote fraud, hinder law-enforcement and national-security activities (regardless of how they are phrased), will lead to costly litigation, and are simply unnecessary." Even though the confidentiality provision in section 3008 of the amendment is better than that contained in section 10 of the SUCCEED Act, it is still not good.